We are becoming more accustomed to continually tracking health metrics with smart wearable devices. The next step will be implantable devices, which provide real-time monitoring of body chemistry. That future is already here and will have significant effects on how individuals and populations monitor their health. Managing risk seeks to assess and control potential adverse outcomes. The analytics of risk management are most readily associated with insurers and financiers. These businesses assess risks such as who is likely to be a good driver or who is the most credit-worthy. Risk management is also central to good health. It requires individuals to reflect on what they eat and drink, how much they exercise, how else they take care of their body, and how often they get a check-up at the doctor. Any risk can be characterised by two components: 1) the frequency of the unwanted or adverse event or condition; and 2) the severity of a given event or condition. This extends to health. Frequency revolves around the number of times we might eat sugar or drink alcohol; severity indicates how much we take in. Frequency and severity in risk management extends well beyond what we consume to managing sleep, exercise, stress, drug intake and more. However, it raises two questions. How do we keep track and monitor the frequency and severity of the health risks we experience; and how differently do frequency and severity impact different individuals? Data is the key to both these questions. The more data we have on the frequency and severity of personal harms, the better risk can be assessed and managed. The better we can identify and change potentially risky lifestyles, the higher the probability that individuals can live a more fruitful and disease-free quality of life. Actuarial analysts are accustomed to segmenting people into risk categories based on age, smoking, health pre-conditions, driving records, and location, among others. Health professionals practice health risk management by segmenting people into risk categories based on similar factors that are often guided by diagnostic tests to indicate whether a person is within a healthy range at any given point in time. The advent of wearables like the Apple Watch and Fitbit has given us an unprecedented opportunity to measure physical and physiological data, such as the number of steps walked in a day, heart rate, heart rate variability, electrocardiogram, galvanic skin response, and temperature. Wearables have taken a large share of the digital health spotlight, as the market for these products is predicted to quadruple to USD 233 billion by 2020. One in six (15%) consumers in the United States currently uses wearable technology that includes smart watches, fitness bands, and even sensor-embedded clothing. However, biochemical tracking, the most important metrics upon which doctors make decisions, is notably missing from current wearables. Physicians typically require drawn blood to analyse body chemistry and would be hard pressed to make diagnostic decisions based on current wearables, which are not able to provide biochemical data. With the exception of pulse oximetry and continuous glucose monitoring (CGM), wearable technology has not provided a key parameter of health: the ability to continuously measure body chemistry. Continuous monitoring of body chemistry provides a window into the physiological effect of physical activity, food intake, stress, and lifestyle. Continuous biochemical data will allow us to much more rigorously assess and manage the frequency and severity of potentially adverse changes in our bodies, changes that ultimately impact how we feel and how we thrive. Profusa is among a growing number of companies who believe the practice of medicine becomes more relevant and efficient if we focus on providing diagnoses and treatments in real-time based on a person’s individual norms. The data allows a more precise understanding of disease probability based on body chemistry at any given point in time. The body is a major repository of untapped data that can be exploited for improving health and managing disease. However, the utility of this data is limited by the ease and frequency of data acquisition and clinical relevancy of the parameters measured. 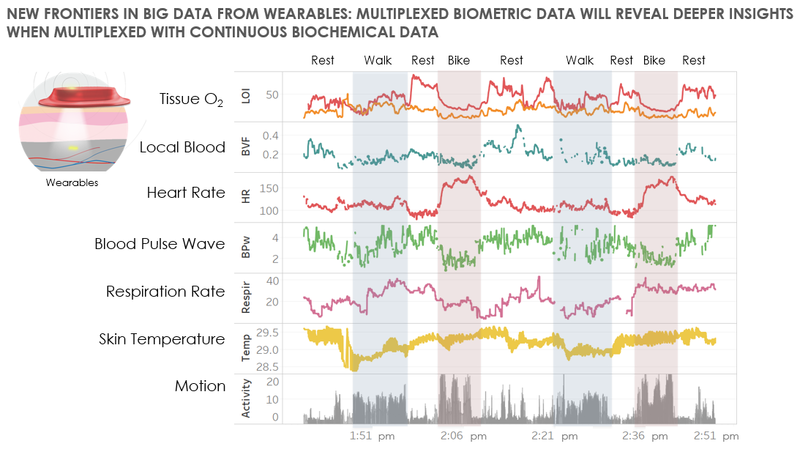 What if we could stream data from within our bodies 24/7? What if it was as easy as looking at your cell phone to see a graph of the chemical changes in your body as you went about your daily life? How would this on-demand information personally improve your health and well-being? What if you could share this information with your healthcare provider instead of having to take a blood test when you felt ill? Or even better, what if an algorithm-generated analysis automatically flagged you or your physician when your body chemistries were going out of range compared to your established parameters, perhaps even before symptoms are present? Three vials of blood, typically drawn as part of an annual physical exam, provide only a snapshot of your body’s health. Body chemistry changes by the minute, and the current model does not reflect real-time changes for many diseases and wellness parameters. The most valuable and important information comes from knowing our body chemistry — to make timely choices and action corrections when our body data is available in real-time. Biochemical sensor technologies that are commercially available to date have provided immense benefit, but only to small subsets of patients who are willing to endure repetitive injections, implantations, and calibrations. Continuous glucose monitoring (CGM) provides a measure of glucose in the subcutaneous interstitial fluid. Current CGM technology is bulky and highly inconvenient, requiring daily finger pricks and weekly self-injection or quarterly device implantation and extraction by a physician. Nevertheless, persons with diabetes who adopt the technology have experienced greatly improved outcomes. The benefit of wearable pulse oximetry is less characterised, but certainly has been a lifesaving standard tool in an intensive care unit (ICU) in non-wearable format, and will undoubtedly be part of an ever-increasing suite of wearable metrics. Profusa is developing inject-and-forget, real-time micro-sensors that empower the individual with the ability to track their unique body chemistry via their mobile phone in unprecedented ways to transform the management of personal health and disease. Prior attempts at long-term, continuous biosensors in the body have fallen short because of the foreign body response, a normal immune reaction to implanted materials. Historically, even biosensors that are considered biocompatible do not function more than a week or two because they provoke a foreign body response characterised by fibrosis (small scar tissue layer that has limited blood supply around the device). Fibrosis starves the device from receiving real-time biochemistry that is reflective of the body. Profusa’s interdisciplinary, bioengineering approach to sensor development has enabled us to break this biocompatibility barrier by creating tissue-integrating biosensors. Profusa has developed biosensors that become one with the body to detect and continuously transmit biochemical data for personal and medical use. Our patented biosensors fully integrate within the body’s tissue — without any implanted metal or electronics — working for years while overcoming the effects of local inflammation or rejection. Combining smart technology on the outside of the body with monitoring of advanced chemistry on the inside, we are developing biosensors to provide immediate, actionable information to individuals, physicians, and public health practitioners. 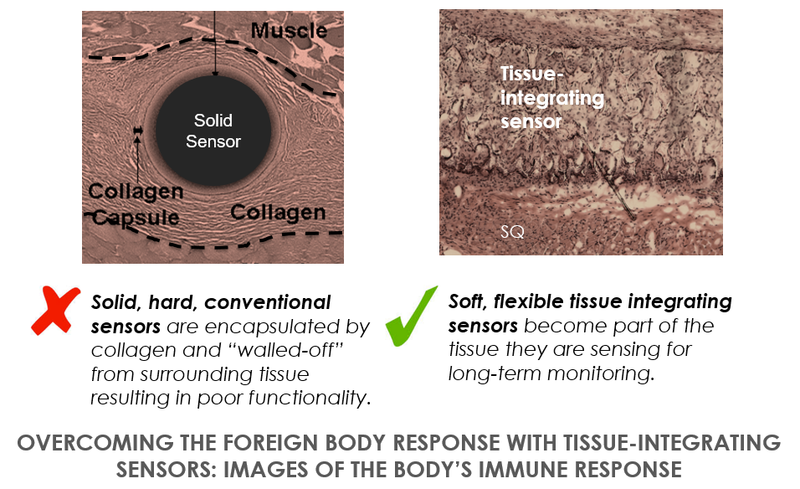 Tissue-integrated biosensors are at the center of Profusa’s proprietary technology. 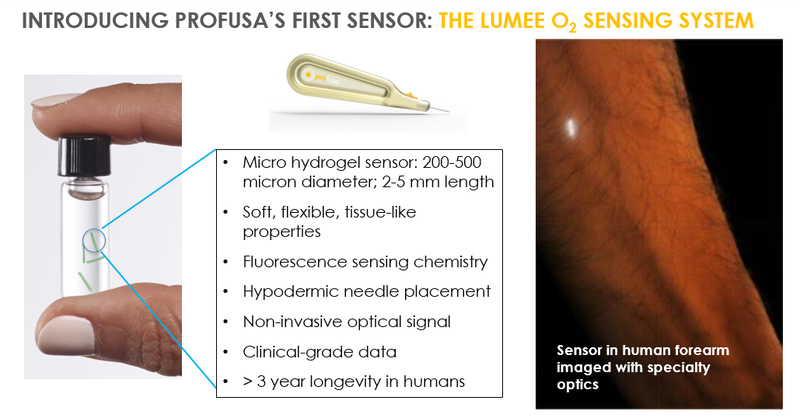 Measuring 2-5 mm in length, and 200-500 microns in diameter, each Profusa biosensor is inserted using a hypodermic needle. Once injected, the soft tissue-like biosensor (similar feel to a soft contact lens) integrates with the tissue and stays in place. The sensor contains luminescent light-emitting molecules that continuously signal the presence of oxygen, glucose, or other desired biomarkers. 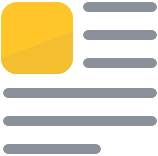 The luminescence is collected by an optical reader which may be integrated into a cell phone. Designed to provide live streaming of clinical-grade data, our tissue-integrated biosensors help provide better understanding of the body in two critical ways. First, it can directly measure key body chemicals, such as oxygen, glucose, or lactate. Secondly, the data streams are continuous in nature, and therefore, real-time. This enables individuals and physicians to apply immediate behaviours that can alter the body’s biochemical state. If, for example, you discover your glucose climbed unexpectedly high after a particular meal, you can take measures to investigate the high-glycemic culprit (for example, a salad dressing whose sugar content was masked by vinegar, a Thai dish with sugar hidden in the coconut milk rice, or an energy drink that had more sugar than expected) and to better manage your diet. Profusa’s first product, the Lumee Oxygen Platform™, recently received European regulatory approval for monitoring of tissue-oxygen perfusion. One of the first applications for the technology is the management of peripheral artery disease and chronic wounds. The company is also developing a continuous biosensor for glucose that can be integrated into an artificial pancreas and a continuous monitor for lactate that can be used for both athletic performance optimisation and monitoring critical care conditions such as trauma and sepsis. Additionally, we are evaluating biosensors for monitoring carbon dioxide, ions, pH, and other body chemistries that can be developed in concert with strategic partners. Over the past few years, the medical profession has been learning the importance of understanding an individual’s norm as well as the population norm for various health parameters. For a specific physiological measure, these two may be different and disparate. For example, a blood pressure of 145/90 may be considered abnormally high for a middle-aged Caucasian male; however this may be ‘normal’ for the individual because his blood pressure has been high relative to the population norm all his life. The same may be true for body chemistries. Creatinine levels may be quite different than that of another person, depending on age, genetics, and environment. This difference may appear ‘abnormal’ relative to the population range, but is perfectly normal for the individual. Continuous, real-time monitoring will have a major impact on the management and prevention of chronic conditions such as diabetes, heart disease, chronic obstructive pulmonary disease (COPD) and sleep apnea. In the case of diabetes, although HbA1c is a valuable metric for understanding the individual’s personal history of glucose metabolism over time, it is not a continuous metric. Moreover, it doesn’t identify one’s prediabetes condition and risk for developing diabetes. Thanks to the shared vision of the US National Institute of Health (NIH) and the Defense Advanced Research Project Administration (DARPA) on the significance of continuous monitoring of body chemistries, over USD 23M has been granted to Profusa to accelerate the development and commercialization of our tissue-integrating biosensor platform. Most recently, DARPA awarded USD 7.5M to develop implantable biosensors for the simultaneous, continuous, remote monitoring of multiple body chemistries. 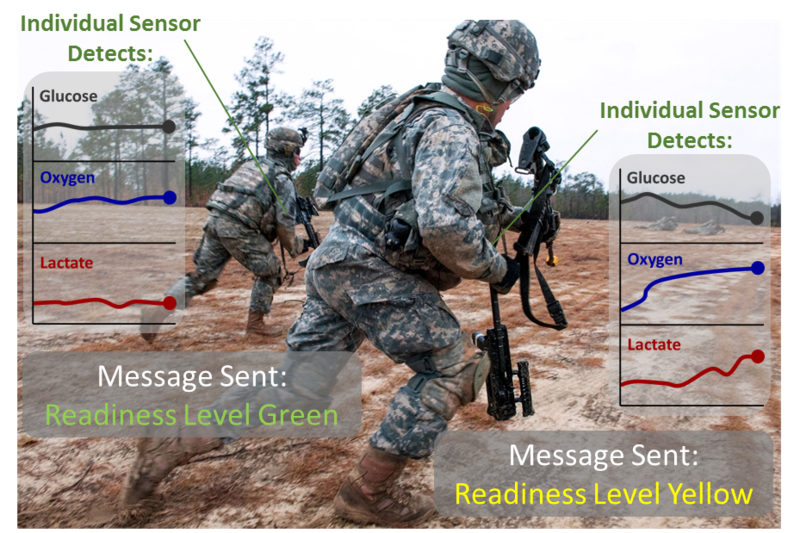 Aimed at providing real-time information about a combat soldier’s health status to improve mission efficiency, the award supports further development of the company’s biosensor technology for real-time detection of the body’s chemical constituents. Long-lasting, implantable biosensors that provide continuous measurement of multiple body chemistries will enable monitoring of a soldier’s metabolic and dehydration status, ion panels, blood gases, and other key physiological biomarkers. Health care providers will be empowered to make a revolutionary improvement in determining the effectiveness of disease management strategies and true costs, as treatments and diagnostics become more real time and individualised. Innovative researchers and pharma companies will be able to improve cost-efficiency and productivity, since much more data can be gathered in real-time. Moreover, public health policy will benefit, as health information is available for analysis as policy changes occur. Continuous monitoring of body chemistry linked to mobile infrastructure has the potential to address the global rise and corresponding challenges in healthcare delivery, especially in regions like China, India, and Africa where not enough hospitals can be built and decentralization of healthcare is extant. Many insurers are using wearable technology to assess the risks in their portfolios; and to engage with their customers to encourage better health behaviour. Taking this tracking to the level of blood chemistry allows insurers both far more data on their insured populations; and their ability to interact with consumers to improve health outcomes. For the individual, continuous monitoring of body chemistry and other health metrics allows one to be more fully engaged in health management and quality of life. Being unaware of the biochemical impact of their behaviours may cause people to age prematurely and lose control of their quality of life. 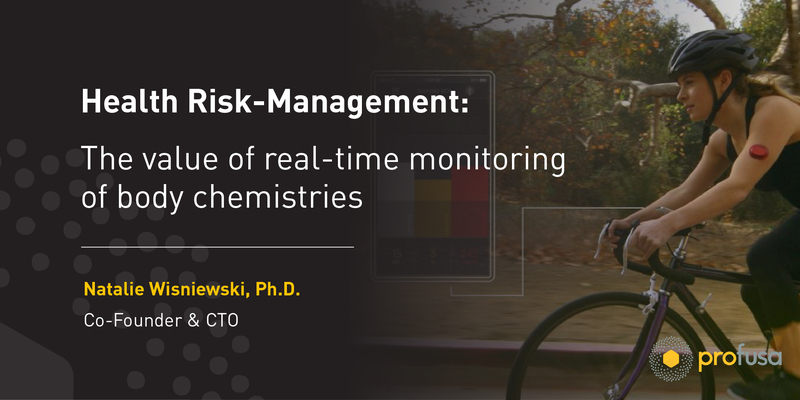 It all comes down to managing health risk — regulating the frequency and severity of adverse events on one’s health and well-being, and that all starts with providing real-time tracking tools to the individual. Article published on Swiss Re Institute.